• How did it get there? • How it is changing? • How do people affect it? • How does it affect people? • Should it be like this? • What may it be like in the future? • What action is appropriate? ​Watch: Why Should I Care About Geography? Watch: What can you do with Geography? 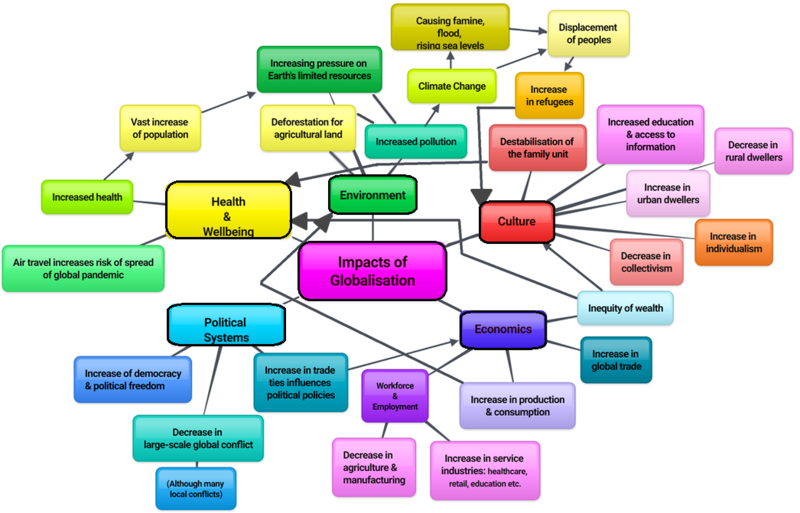 Students look at the changes that globalisation is pressing on our world. They will examine changing global relationships, poverty and wealth and the use or misuse of the world’s natural resources. Participating in bringing this about makes them an active citizen. Definition: Globalisation is the term used to describe the way that countries are becoming more interconnected, both economically and culturally. It is an international process driven by trade, investment, technology and finance. Advances in technology have meant that people, companies and nations are no longer restricted by national borders and geographical distance. The world is more closely connected and, as a result, it is often thought to be a 'smaller place'. For much less than it has cost in the past, new communication technology has allowed people to instantly contact friends and family on the other side of the world through a variety of media, including text messages, telephones, facsimile machines, web cameras and instant messaging. Improvements in transport technology mean that people can now visit their loved ones anywhere in the world in less than 24 hours. Goods and services can also be transported more easily across borders. The combination of improvements in technology and the lifting of many restrictions on trade between countries have resulted in an increase in international trade. Globalisation can be divided into four different components: participants, markets, rules and equipment. Trade negotiations were originally made solely between colonies or countries. In recent times, the World Trade Organisation (WTO) has enforced the rules and settled disputes over the global trading system. It oversees agreements which have international legal status and therefore has a degree of power over national governments. Large transnational companies also have an increasing amount of power as their financial capacity exceeds that of some nations. Globalisation has changed the market by providing more freedom to trade between countries. It has also resulted in an expansion of the market, with countries being able to trade with any nation at any time. National markets are being replaced by international ones, as companies continue to develop on a worldwide scale. New rules and laws have been introduced to accommodate a more unified world. Agreements made by multiple nations are called multilateral agreements. This means that national governments are required to not only uphold their own national policies but also those of the multilateral agreement. There has also been an increase in the number of standards such as copyright laws, which have been made universal. The establishment of the International Criminal Court and International Court of Justice also reflects the changing needs of a more global society. Globalisation is characterised by the new equipment and technology which has assisted it in becoming such a major force in recent times. Mobile phones, facsimile machines and the internet are examples of new technologies which have allowed companies to expand and connect with others around the world. - human physical well-being of societies around the world.